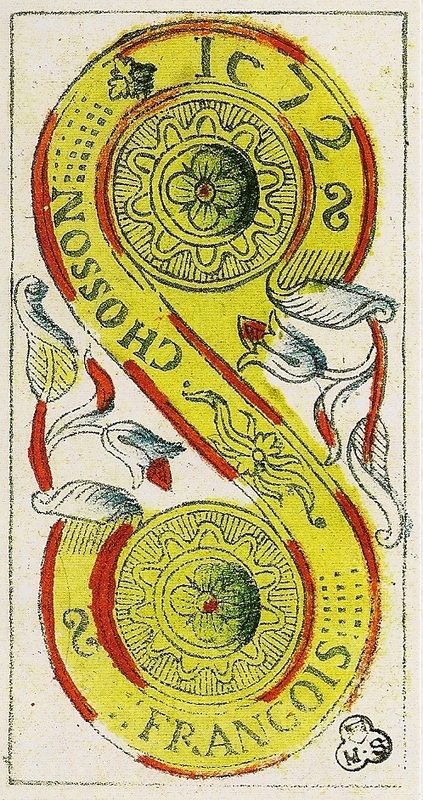 This deck is a facsimile of the Chosson Tarot in the Historical Museum Blumenstein in Solothurn. It is a limited edition of 3000, mine is number 104. 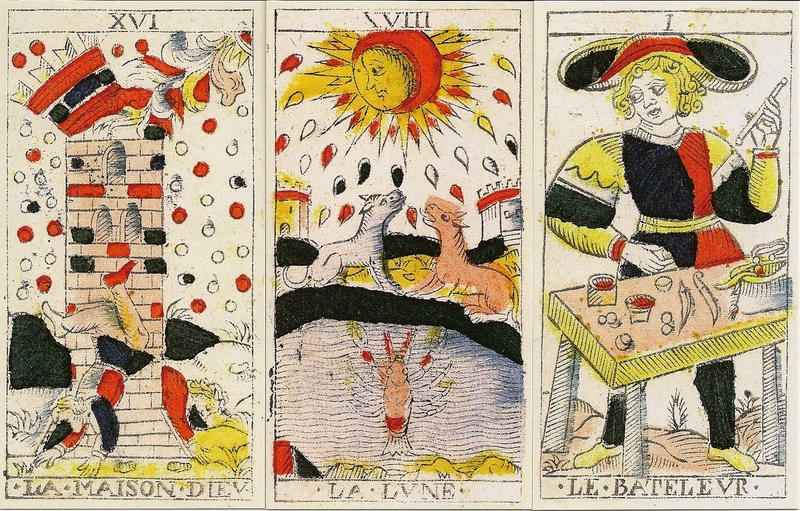 The original Tarot Chosson is uncertain in dating. On the 2 of Deniers appears as date 1672. A proofed date is April 21, 1736, when Francois Chosson deposited two copies of the sheet of packaging (also reproduced with the present facsimile), one to the trade association of the traders and cardmakers, the other in the Clerk's Office of the Police of Marseilles. 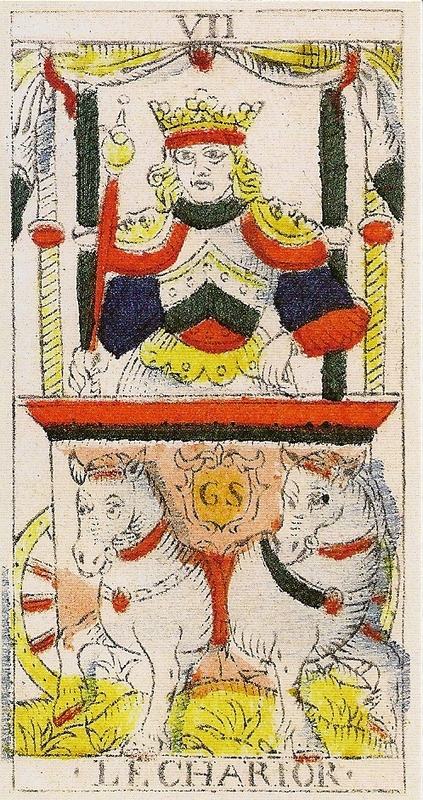 The initials of the engraver on the Chariot and the Two of Cups are "G.S." 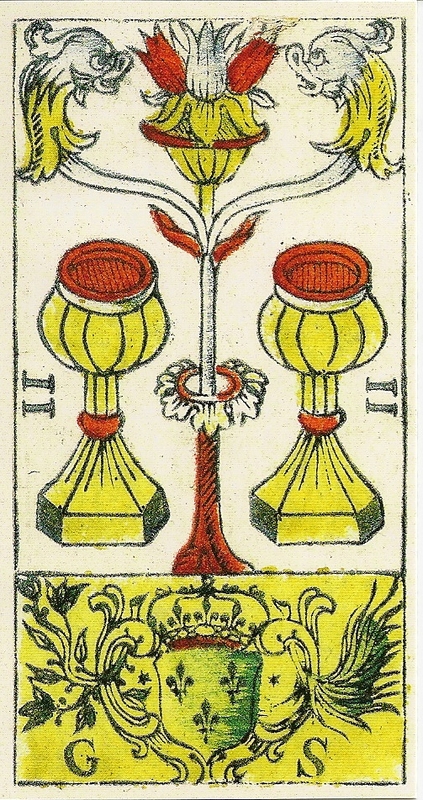 There are not many known cardmakers with the initials GS in the right dates, but there is a "Guilhen Sallonetz" mentioned together with his father or brother Jacques Sallonetz in Marseille in 1662. Further in the list, there are others - Guillaume Sellon (1676-1715), Jacques Sellon (1676-1708), along with Jean-François Sellon (1676-1688) Antoine Sellon (1713-1715), and Claude-François Sellon (1730) - all in Marseille. The names Sallonetz and Sellon are probably two forms of the same name, one in Provençal, and one in French. "Guilhen" is a Provençal form of "Guillaume" . So there seems to be a family business that is attested from 1662-1730. Perhaps Chosson bought it after the final Sellon retired. Another point about the 2 of Deniers is that the name Chosson has smaller and thicker letters than name François. Also, the name "Chosson" does not curve properly in relation to the curve of the banner, unlike the elegant and properly-fitted "François." Maybe that the name "François" is the original 1672 name, and that "Chosson" was added later (old name cut out, new name glued in). The old name then must have been "Sellon". Two of the Sellon family have the middle name "François" - Jean-François and Claude-François. 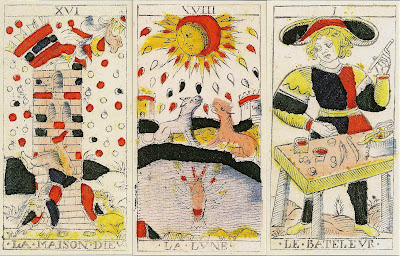 Since a tradition among French families is to give the son(s) the middle name of the father,it is possible that "François Sellon" was the founder of the house and his presumed son Guillaume is the engraver (a detailed discussion on the dating of the Chosson Tarot can be found here ).